If you’ve driven east out of Chardon, OH on US Rt. 6, you may have passed an old rusted relic of a car, sitting in front of an auto restoration business. I’d driven by it many times and often thought that it offered some photographic possibilities. Finally, one snowy, muddy day, I decided to drive out and photograph it. It was a tricky, contrasty shooting situation with white snow all around and this dark brown rusting relic sitting in the midst of all that whiteness. I did the best I could on the exterior shots, not really happy with any of them and then decided to see what the interior offered. The side windows were gone, so I had a clear view and when I looked inside and saw the dashboard I knew I would come away with some interesting shots. This turned out to be my favorite. You can see a lot of detail in the dashboard instruments and in the nameplate in the center, you can vaguely make out the Plymouth name. I’m curious, can anyone pinpoint the model year of this vehicle? 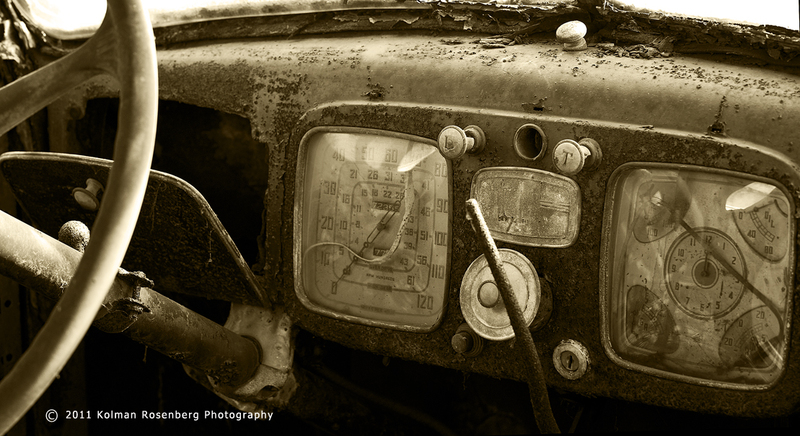 This entry was posted in Uncategorized and tagged antique, dashboard, guage, ignition, instrument, key, plymouth, relic, restoration, speedometer, steering, switch, wheel. Bookmark the permalink. Kolman, so much age and texture in this shot. I can almost smell the fertile soil and cigarette smoke from this. Lovely.